A video comparing the intros of Majora’s Mask on the N64 and Majora’s Mask 3D has been uploaded to Youtube by user Master0fHyrule. The video shows scenes from the title sequences and the games’ introductions– taking us around Clock Town and then into the Forest for that fateful altercation with Skull Kid. The graphics are greatly improved, and few things have been drastically altered. You can judge for yourself whether the 3D intro imparts the same tone as the original. 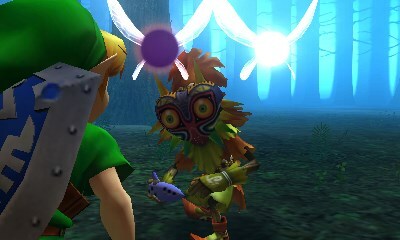 Some of the changes I noticed: The mist in the forest is more blue than grey now, there are added details to the setting like mushrooms on the trees and sprouts on the ground, Tael’s text is in a darker purple, and Skull Kid’s aura when turning Link into a Deku Scrub is now solid purple rather than purple and yellow. One larger change is in the hallucination sequence during Link’s fall through the tree, the icon for Majora’s mask is now seen in purple and a new icon can be seen in red that is presumably meant to represent the Fierce Deity’s mask. Most of these changes are to be expected in a conversion to 3D, but some of them ruin the ambiance for me. The mist being blue takes away from the creepy desolate nature of the forest and Skull Kid’s aura being just purple is less mesmerizing. Though I appreciate a nod to the Fierce Deity’s mask right off the bat, I still feel it should be kept under wraps until the very end. What do you think about the new introduction? Does it produce the same effect as the original? Does it add to the hype? Speak your mind in the comments!